Three-ingredient recipes (a.k.a. trios) make life easier and more delicious. Try 'em out! We gave the classic deviled egg a 2015 makeover. Très chic! Cook bacon until crispy, either in a skillet over medium heat or on a microwave-safe plate in the microwave. (See package for cook time.) Chop or crumble. Place mashed avocado in a small bowl, and mix in a dash of each seasoning. 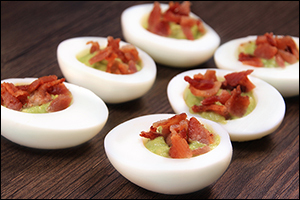 Distribute seasoned avocado among egg white halves, and top with chopped/crumbled bacon. Prepare to meet your new favorite meal... 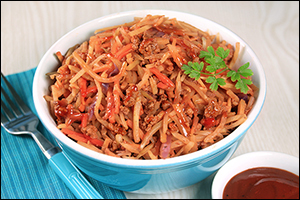 This stress-free stir-fry is beyond-words delicious! Bring a large skillet sprayed with nonstick spray to medium-high heat. Add broccoli slaw and 1/2 cup water. Cover and cook for 8 minutes, or until fully softened. Uncover and, if needed, cook and stir until water has evaporated, 1 - 2 minutes. Transfer to a medium bowl, and cover to keep warm. Remove skillet from heat, re-spray, and return to medium-high heat. Add beef, and sprinkle with 1/8 teaspoon of each seasoning. Cook and crumble until fully cooked, 2 - 3 minutes. Return slaw to the skillet, and add BBQ sauce. Cook and stir until hot and well mixed, about 2 minutes. If you like, add more seasonings to taste. 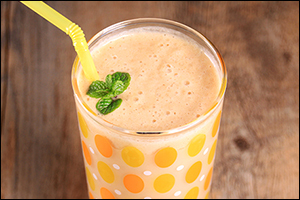 So easy to make, and so yummy to sip! Mango is the best! Place ingredients in a blender, along with 1/4 tsp. cinnamon and 1/2 cup crushed ice (or 5 - 8 ice cubes). Blend at high speed until smooth, stopping and stirring if needed. Hungry for More 3-Ingredient Recipes? Bet you can think of a trio of pals who'd love these recipes -- click "Send to a Friend" now!